A delicious part of book blogging is looking forward to books. Let’s face it: books make our mouths water. 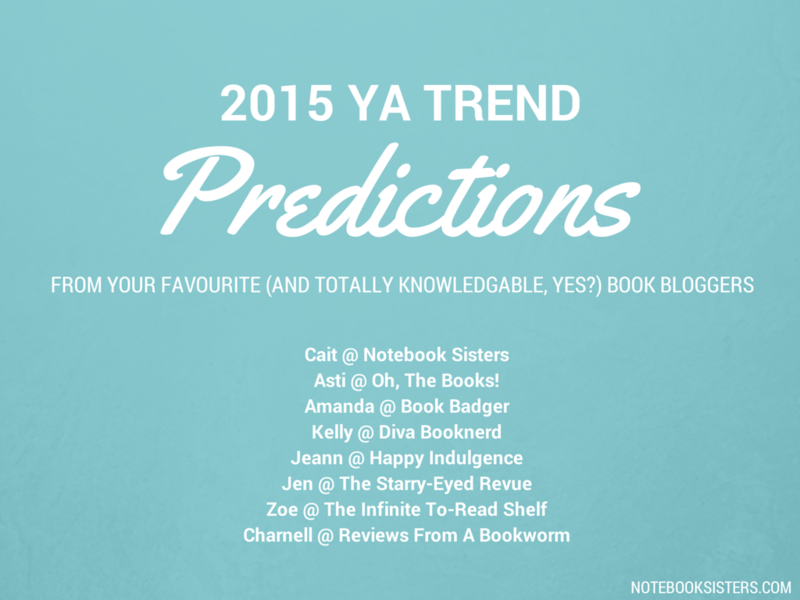 And with 2014 wrapping up, our brains are straying to next year’s YA releases and wondering what the trends will be. Although my opinion on these things is (obviously) fabulous…I thought it’d be nice to swim through the blogosphere and ask other bookish bloggers what they think 2015’s trends might be. They humoured me greatly. They are the nicest friends. And I accumulated a glorious post of our predictions! I think 2015 is going to be the year Fairy Tale Retellings (which makes me insanely happy because retellings are my favourite). Sure I’m a teeny tiny bit worried they’ll explode (like vampires) and everyone will write a retelling and we’ll lose the quality…but for now? I’m enjoying it! Movies definitely inspire people to read and, on the film front, we have Into The Woods and Pan and Disney’s new Cinderella. Then coming from 2016 onwards is Pinocchio (played by RDJ!) and The Huntsman and Beauty (with Emma Watson). But for the bookish front we have (of course) the retelling queen, Marissa Meyer, with Fairest and Winter. Then A.G. Howard’s Alice in Wonderland retelling concludes with Ensnared. Danielle Paige brings us Dorothy Must Die #2 with The Wicked Will Rise. OH and let’s not forget Rosamund Hodge’s Crimson Bound! There’s also A Wicked Thing (Sleeping Beauty) and Beast Charming. Phewf. Is that enough? WAIT LET’S SQUEEZE IN ONE MORE! How about Sarah J Maas’ new retelling of Beauty and the Beast with A Court of Thorns and Roses?!! WHO IS EXCITED FOR THIS? I’d think I could confidently say, based on what people have enjoyed in 2014, and the film adaptations that have come about within the last year, that there could be a surge in the amount of Mystery/Thriller novels next year. Looking at how well novels such as Don’t Look Back, Dangerous Girls/Boys and Gone Girl have done within 2014 and the constant and need and want for more criminal based reads, I don’t think it would be a far cry to expect novels like The Dead List by Jennifer L Armentrout and Liars Inc by Paula Stokes to do very well. I also think with the craze brought on from the ending of The Lunar Chronicles, that 2015 could prove a good year for retellings too, with Crimson Bound, Mechanica, A Wicked Thing and the start of Rick Riordans fourth mythology series, Magnus Chase and The Gods of Asgard, but to mention a few, and of course, the release of both Fairest and Winter by Marissa Meyer – it really shouldn’t be surprising that other authors would jump onto a genre/sub-genre that has pleased an awful lot of readers lately. I, for one, am most interested in reading The Dead List and The Fill-In Boyfriend, as well as finishing The Lunar Chronicles and The Unknown Assassin series’ and I hope I’m not let down. While this isn’t a genre, I think the reading area that will be (or should be) hot in 2015 is VILLAINS! Personally, I find it fascinating when we are able to see the villain’s point of view in a story. To understand why he or she is motivated to do such horrible things in the world and if there is ever a chance for redemption is a really intriguing thing, and I think with so many horrible things happening in the world daily there is a certain desire I think to understand why people fall into such desperation situations. Plus you have movies like Maleficient and books like The Young Elites and Vicious, which have received great interest from readers proving there is a desire for this type of story. That all being said, I am sure you can guess which book I am most excited to read in 2015 – Fairest by Marissa Meyer, the “bridge book” between Cress and Winter in the Lunar Chronicles where we get to see Queen Levana’s side of the story. I haven’t actually read Cress yet, but I plan on doing so soon because I want to read Fairest as soon as it comes out! Personally, I think magic realism will be one of the main genres in young adult next year. In the past few months we’re seeing a trend of authors mixing generic teen contemporaries and fantasy, which doesn’t always result in a compelling read. Overall, I’m not a fan of the genre, and I’d prefer to see apocalyptic make a comeback. Not necessary dystopians, but natural disasters that show characters fighting to survive. And more standalone novels, because sometimes I don’t want to invest in an entire series that could have been wrapped up within one book. The books I’m most excited for are Conspiracy of Blood and Smoke, The Winner’s Crime and most importantly Ensnared. Because honestly, who doesn’t need more Morpheus in their life. To be honest, I think fantasy will be a popular genre come 2015. After the success of series such as Throne of Glass and Shadow and Bone, I have a feeling that authors will find this to be a “go-to” genre in terms of marketing. And only one or two?!? GAH! THAT’S SO HARD! *thinks deeply* I’m going to have to go with Winter by Marissa Meyer and the untitled 3rd book in the Starbound trilogy by Amie Kaufman and Meagan Spooner. So I’ve seen a few different YA genres rise and fall over the past few years, it’s amazing how short lived they usually are. First it was paranomal with the VA and Twilight craze, then paranormal books became boring and substandard. Then we saw the dystopian trend rise up after The Hunger Games, with many, many clones of it in it’s wake. 2014 was the year of contemporary, I can’t count how many different contemporary books I’ve read this year. From the heart-wrenching, to the light and funny, to the meaningful and thought provoking, it was a great year of YA contemporaries. On the wake of These Broken Stars, the Lunar Chronicles series, Dissonance and A Thousand Pieces of You, I can see YA sci-fi being the next big thing! Which is awesome, because it combines some amazing technological concepts with futuristic worlds. I just CANNOT WAIT until WINTER is out by Marissa Meyer! I mean this series is the best fairytale based sci-fi story I’ve ever read. I ship most of the couples in here too, especially my favourite Cinder and Kai. Retellings have always been a thing, but it does seem like they’re gaining momentum here lately, and I anticipate that we’re going to see even more of them in the coming year. I’ve already added several to my TBR: two from Marissa Meyer –Fairest and Winter, A Court of Thorn and Roses by Sarah J. Maas, Crimson Bound by Rosamund Hodge, and A Wicked Thing by Rhiannon Thomas. I also think criminals and crime families are going to be an oft-seen trend in YA lit in 2015, one I’m delighted about, if I’m being completely honest. After loving The Curse Workers series by Holly Black, I’ve been hoping for similar stories to see the light of day, and it’s like someone heard my prayers…just look at all of the new crime-related stories arriving next year: Liars, Inc. by Paula Stokes, All Fall Down by Ally Carter, Hold Me Like a Breath by Tiffany Schmidt, and Lies I Told by Michelle Zink. I think contemporary YA will be on the rise, which seems silly because how could it get even bigger than it is now. But with the success of the TFIOS adaptation, we’re beginning to see more YA contemporaries turned into films. That’s always good for the book genre because those books begin to sell like crazy and then publishers are looking for the next big thing in contemporary. So I would put my money on contemporaries being the biggest thing next year. I’m excited for the release of All the Bright Places by Jennifer Niven because, even though I’ve already read and loved it, I can’t wait for everyone else to get to read and experience it. They need to feel the joy and pain too. The other genre I hope to see on the rise is YA fantasy, which I definitely feel will be the case next year. I might be basing that solely on the fact Sarah J. Maas has not one but two books releases next year. And, to me at least, she is the YA fantasy author. Releases I am most excited for: Throne of Glass #4, A Court of Thorns and Roses and All the Bright Places. Haymitch (and coincidentally, me too) approve of EVERYONE. Thank you so incredibly much to all the bloggers and their fabulous opinions! I love this post. (Just sayin’. 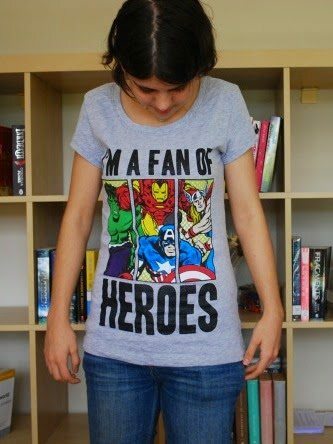 I do.) But you know what I also would like? YOUR OPINION. I want to know your predictions, blogglings…and also want to know your verdict on ours. A lot of us are hedging bets on Marissa Meyer bringing retellings to shine in 2015…but we’re also voting on crime and contemporary quite a lot too. So your opinions on trends for 2015? Comments! LET US DISCUSS. I could totally see fairytale retellings gaining momentum, but maybe that’s just because I’m eagerly awaiting Princess of Thorns. I’m sure contemporary will continue to be just as big, but I’d welcome more scifi or apocalypse-themed books as well. Or something with magic in it. Because, you know, that always makes things more interesting. Also, EVERYONE seems to have read The Lunar Chronicles except for me!